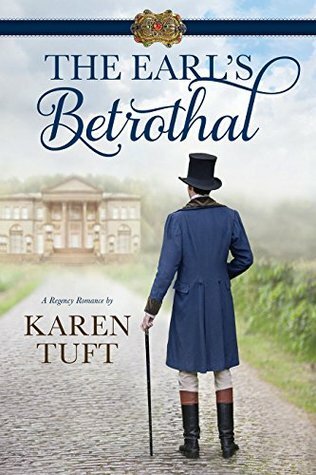 The Earl's Betrothal by Karen Tuft. Audience/Genre: Adult, Regency Romace, Clean Read. Publication: May 1st 2016 by Covenant Communications. I’m really starting to like the Regency Romance books! They speak of a different time of kindness, chivalry, being respectful and trying to avoid scandal. They had their scandal’s too as one of the characters had a mistress. But overall, I love it! The Earl’s Betrothal has 2 POV’s by both Amelia and Anthony. The story telling is well written. I was totally engaged throughout the book. The descriptions made it easy to see what was going on in my head. The characters were easy to understand and to either like or dislike as some of them were!! I also loved Lucas! He is a good friend. Maybe we will get a story on him??? Amelia is now living with the Ashworth’s after her parents died. She has no other living relatives and her father told her on his death bed to seek out Lady Walmsley. She did and was recommended to be the companion of Lady Ashworth. Amelia works hard and cares even harder for those in the household. Then the second son of the Marques comes home after being declared dead during the war. They were mourning the loss of both sons but now they have something to celebrate. The father was doing very poorly and is recovering some after his son, Anthony, returns. Anthony now the Earl of Harlford has returned but he seems to suffer nightmares and nausea from some of the experiences he witnessed. He is mostly recovered from a gunshot wound as well. He wants peace and solitude. His father demands of him to marry soon and produce heirs. When Anthony and Amelia first meet, they are attracted to each other. But it is not acceptable for them to ever be together with their different social classes. But sometimes, the heart wants what the heart wants. This is their story of struggle with their attraction to one another and some stolen kisses that were eventually caught by others. Now Anthony will marry her to keep her reputation intact. But it isn’t that easy and there is an enemy keeping them apart as well as society and Anthony’s own demons to name a few. Anthony will need Amelia to help him heal. Amelia will need Anthony to help her navigate in his world. The little things they do for each other are oh so sweet! Okay, I am totally swooning! It is a beautiful love story in a far gone time. The ending will make you cry and sigh! Karen Tuft was born with a healthy dose of curiosity about pretty much everything, so as a child she taught herself to read and play the piano. She studied composition at BYU then graduated from the University of Utah in music theory as a member of Phi Kappa Phi and Pi Kappa Lambda honor societies. In addition to being an author, Karen is a wife, mother, pianist, composer, and arranger. She has spent countless hours backstage and in orchestra pits for theater productions along the Wasatch Front. She also has a 75 percent success rate when it comes to matchmaking and is a big believer in happy endings. Among her varied interests, she likes to figure out what makes people tick, wander through museums, and travel—whether by car, plane, or paperback. I really did! Thanks for writing it so I can live vicariously through your characters. Because I like my amenities and couldn't actually live in those times!